In this blog series, I show you how many of the 7 Deadly Foods are found in various processed and prepared foods. In this post, you get to see how healthy the Big Mac Value Meal is. (1) This meal is comprised of a Big Mac, fries (with ketchup), and a Coke Classic. Wheat: Big Mac Bun (Enriched flour [bleached wheat flour, malted barley flour], contains 2% or less of the following: wheat gluten), Big Mac Sauce (vegetable protein [wheat]), vegetable oil for french fries (natural beef flavor [wheat derivatives]). Soy: Big Mac Bun (soybean oil and/or partially hydrogenated soybean oil, contains 2% or less of the following: dough conditioners [soy flour], soy lecithin), Pasteurized Process American Cheese (soy lecithin [added for slice separation]), Big Mac Sauce (Soybean oil, vegetable protein [soy], soy lecithin), vegetable oil for french fries (hydrogenated soybean oil). Gluten Grains: Big Mac Bun (Enriched flour [bleached wheat flour, malted barley flour], contains 2% or less of the following: wheat gluten), Big Mac Sauce (vegetable protein [wheat]), vegetable oil for french fries (natural beef flavor [wheat derivatives]). Refined Sweeteners: Big Mac Bun (high fructose corn syrup, sugar), Big Mac Sauce (pickle relish [high fructose corn syrup, sugar, corn syrup], high fructose corn syrup, sugar), dextrose, Ketchup (high fructose corn syrup, corn syrup), Coca-Cola Classic (high fructose corn syrup). Chemical Additives: Big Mac Bun (contains 2% or less of the following: calcium sulfate, calcium carbonate, ammonium sulfate, ammonium chloride, dough conditioners [sodium stearoyl lactylate, datem, ascorbic acid, azodicarbonamide, mono- and diglycerides, ethoxylated monoglycerides, monocalcium phosphate, guar gum, calcium peroxide], calcium propionate and sodium propionate [preservatives]), Pasteurized Process American Cheese (sodium citrate, citric acid, sorbic acid [preservative], sodium phosphate, artificial color, lactic acid, acetic acid), Big Mac Sauce (pickle relish [calcium chloride, xanthan gum, potassium sorbate (preservative), polysorbate 80], propylene glycol alginate, sodium benzoate [preservative], caramel color, calcium disodium EDTA [protect flavor]), vegetable oil in french fries (citric acid [preservative]), dextrose, sodium acid pyrophosphate (maintain color), Ketchup (natural flavors [vegetable source]), Coca-Cola Classic (caramel color, phosphoric acid, natural flavors [vegetable source], caffeine). 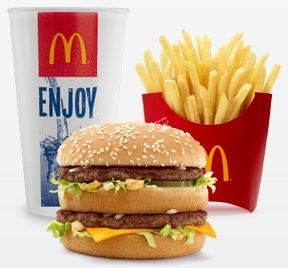 High Omega-6 Oils: Big Mac Bun (soybean oil and/or partially hydrogenated soybean oil), Big Mac Sauce (Soybean oil), vegetable oil for french fries (canola oil, hydrogenated soybean oil). Trans Fats: Big Mac Bun (partially hydrogenated soybean oil). From the ingredients list above, you can see that this product has all seven deadly foods. Final Thoughts: I was expecting the McDonald's Big Mac meal to be worse than the Hungry Man Turkey dinner, but it isn't. However, it is still filled with quite a bit of sugar, wheat, soy, and chemical additives. If you want a burger and fries, just make them yourself (and have water instead of soda). Your body will thank you for it!